There is nothing quite like sinking your teeth into a silky, deliciously decadent piece of chocolate. It seems as if chocolate has always been around, lending itself to awkward first dates, romantic Valentine’s Days, and those “just because” moments. In fact, chocolate has been around for a very long time — but not as the sweet treat we know today. Chocolate made its first appearance in Mesoamerica as far back as 1900 BCE. The Aztec people harvested the seeds of the sacred cacao tree to make a frothy, bitter, fermented beverage. Thought to give the drinker strength, the Aztecs believed that this tree and its seeds were a gift from Quetzalcoatl, their god of wisdom. They put such value on these seeds that they were actually used for currency by the Aztec people. It wasn’t until the beginning of the 16th century that chocolate, still in its raw cacao form, arrived in Europe. It was the explorer Cortés that brought this mysterious concoction from the shores of Aztec-ruler Montezuma’s empire to the castles of the kings and queens of the Old World, and the European ruling class was immediately intrigued. 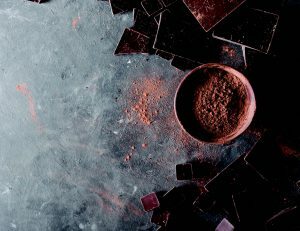 Known only from romanticized stories of the “savage” Aztec people, chocolate developed a reputation as a rich, decadent aphrodisiac from the jungles of an exciting new world. Before long, the first European chocolatiers began to sweeten the bitter Mesoamerican beverage with sugar and honey. With that, modern chocolate was born, and the world could not get enough. Perfect as a gift for your favorite chocolate lover or for those moments when you just need a bit of sweetness in your life. Chocolate is, after all, a gift from the gods.